Shale oil is a high-quality crude oil that lies between layers of shale rock, impermeable mudstone, or siltstone. Oil companies produce shale oil by fracturing the layers of rock that contain the layers of oil. Don't confuse shale oil with oil shale. That is rock suffused with kerogen, a precursor to oil. In some cases, shale oil describes oil that's been converted from kerogen in shale rocks. First, oil companies drill down as far as two miles, where the layers of oil and shale exist. They then pump high-pressure bursts of water, sand, and chemicals to fracture the shale and release the oil. The sand holds the fractures open. That allows the oil to seep into the well. In the Bakken fields, drillers use multistage fracking to create longer cracks. They perforate short segments of the production casing. That allows them to concentrate the bursts of water in targeted spots. The second technological advancement was horizontal drilling. After operators drill the well, they curve it at a 90-degree angle. They then run it horizontally through the thin formation. The horizontal well can run for as long as two miles. Although some companies used horizontal drilling as early as 2004, it didn't become affordable until 2009. That's when Brigham Oil & Gas successfully split a single horizontal leg into 25. The company fracked each leg independently, providing a higher return on the investment. Shale oil extraction methods are more flexible than traditional oil well drilling. The initial drilling only accounts for 40 percent of the total cost. Extracting the oil costs roughly $1 million for each well. That made shale oil extraction profitable when oil reached $100 a barrel. When oil prices fall, shale oil companies keep drilling. They stop extracting and store the oil in the ground. They call these wells DUCs for ​drill and cover. They can safely wait until oil prices return to $60 a barrel. At that point, they can start extracting oil from the wells they've already drilled. That will keep prices from rising much above that price level. The latest oil price forecast shows they will remain in that range. That's important because oil prices are determined by much more than the laws of demand and supply. Investor sentiment has more influence on oil prices. They trade oil on global commodities exchanges. Traders can bid the price of oil down or up, depending on their assumptions of factors affecting oil. They created an asset bubble in oil in 2008. They drove the price of West Texas Intermediate up to $145 a barrel. These traders are the main factor that makes oil prices so high. That was despite the Great Recession. Prices dropped to $30 a barrel later that year, simply because of fear, not a significant change in supply or demand. The volatility in oil prices made gas prices in 2008 do the same thing. In 2011, oil prices rebounded to $100 a barrel. As prices remained in that range, shale oil producers started drilling wells. They flooded the market, driving prices down in 2014. By that point, they had learned how to extract more cheaply. That created a U.S. shale oil boom that led to a bust. Fracking is controversial for two reasons. First, it uses a lot of natural resources. Before drillers can extract the first drop of oil, they must pump in 800 truckloads of water. They also use hundreds of truckloads of other material. Unless the water is already on site, it must be trucked in. There it is stored in huge tanks before the fracking can begin. The composition of the fracking fluid is proprietary to each company. Second, the effects are unknown. That's because frackers don't have to comply with the Safe Drinking Water Act. Communities don't know what chemicals nearby wells leach into the water table. Most of the water that's pumped returns to the surface. Unknown underground chemicals can contaminate it. That includes trace amounts of radioactive material. Typical water treatment facilities are not equipped to deal with this water, so it oil companies pump it into ponds. Scientists are still studying the long-term impact of this water. 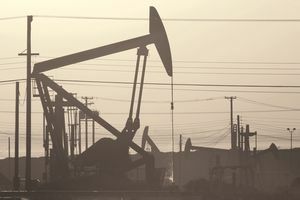 Fracking may also cause earthquakes. The U.S. Geological Survey released maps that show some parts of Texas and Oklahoma now have the same risk for earthquakes as California. Seven million people who live near fracking wells are in danger. The wells cause earthquakes by pumping wastewater into special disposal wells. The high-pressure pumping may trigger shifts in the fault lines. The risk of quakes has risen dramatically since 2014.